Learn about the Bounty System, and the Weekly Bounties in Tom Clancy's The Division 2! This guide includes how to obtain bounties, & what are the bounties of the week! There are multiple ways to earn bounties in the game. During the campaign, certain zone liberation projects award you with bounties to complete upon completion of the project. Check Out Our Guide On Projects Here! 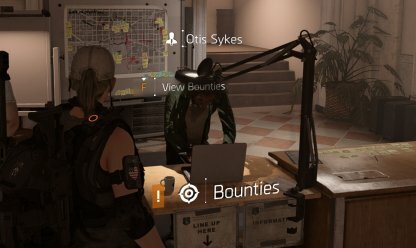 Once recruited, Otis Sykes will be available at the Base of Operations to manage your bounties. Trade in your Target Intel currency to activate bounties. To recruit him, complete 2 of 4 Main Missions in the Campus Settlement. Check Out All Main Mission Guide & Walkthrough List Here! If you are a member of a clan, agents of that clan will be awarded weekly bounties to complete. A mysterious NPC The Snitch, offers bounties for players who can find him. Upon reaching the end game, players will get access to the Priority Target Network, a progression tree of weekly bounties. This can be accessed once they unlock World Tier 4 difficulty. Completing these bounties will unlock a final Heroic Bounty which will grant a hefty reward. 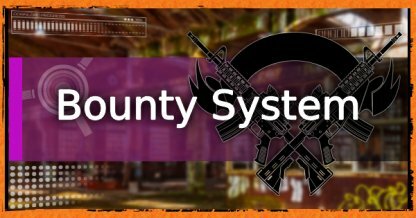 Bounties is a reworked iteration of the High Value Target system introduced in The Division. 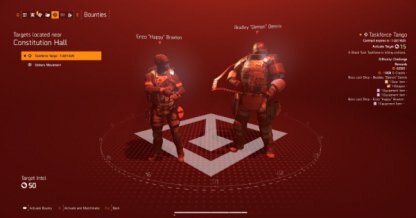 Bounties put a price on enemy bosses to reward agents for eliminating hostile threats in Washington D.C.
New to The Division 2 is that many of the bounties are procedurally generated and act as if they are Division agents. 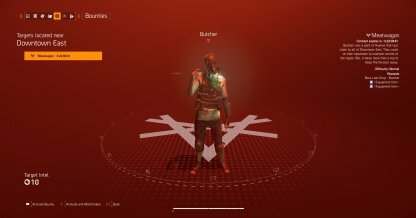 A boss may utilize skills used by agents, and each time a player tracks a boss, that boss selects a location that complements their abilities. Unlike in The Division, the new bounty system will retain failed bounties so players can give it another go without the risk of losing Target Intel currency. However, targets will relocate and will reinforce themselves!